The winners of the 2017 Hugo Awards were announced on Friday and I would like to offer a hearty congratulations to all of the winners. I've listed them below and for those who don't quite remember who all was nominated (we were! ), here is a link to the full list of nominees. This is a somewhat weird and difficult essay to write. Every year I write about the Hugo Awards because I love this process and I love being a part of the conversation about the awards. The thing is, when I did this in the past I was doing so from the outside. I was writing as someone who could only dream of being a finalist for the Hugo Award, let alone a potential winner. This year. This year Nerds of a Feather was a finalist for Best Fanzine. We said thank you when the final ballot was announced, and let me tell you, it was difficult to keep that news quiet for the few weeks between being notified and when the announcement was made public. We would like to again thank everyone who thought well enough of us to actually put us on their nominating ballot and did so in sufficient numbers to place us on the final ballot. That is awesome, amazing, and humbling. The field is so diffuse and there are so many venues producing really great writing and commentary that it is difficult to truly come to a consensus on which blogs and websites and more traditional fanzines are the ones to stand out from the field. That Nerds of a Feather was considered to be one of them last year is a true honor. So, thank you. Next, we would like to thank everyone who then considered us for the Hugo when it came time to vote. Wherever we ranked on anyone's ballot, thank you for taking the time to thoughtfully consider our submission to the voter's pack and to then vote for us. We knew this was going to be a difficult ballot for us. Lady Business had been on the ballot last year and the editors there do fantastic work. Discussing our chances, we always figured they were the odds on favorite. Journey Planet had been a finalist 2012-2015, finally winning in 2015. As a now five time finalist, they were always going to be a strong contender. SF Bluestocking is my personal favorite blog that isn't called Nerds of a Feather. Bridget McKinney does some of the best fan writing today. Rocket Stack Rank has a strong focus on short fiction reviews and has been an excellent resource, to the point that it is linked on the Hugo Awards website as a "third party recommendation" site. The fact that we came in third place, behind only the winning Lady Business and the second place Journey Planet is astounding. We're grateful to everyone who ranked us so highly on their ballots (or, to be honest, included us on their ballot at all). This was a fantastic group of fanzines to share our first Hugo Award ballot with and we are honored to have had the opportunity. 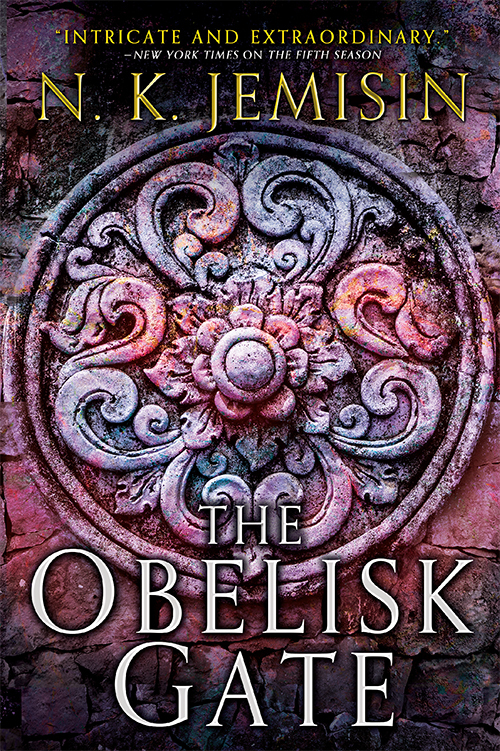 The Obelisk Gate (my review) was my favorite novel of 2016 and I could not be happier that it won the Hugo Award for Best Novel. It truly is. The Broken Earth is shaping up to be one of the most spectacular fantasy series ever published and I do not intend that statement as hyperbole. This also marks the second consecutive Best Novel win for N. K. Jemisin (the first was The Fifth Season (my review) at the 2016 Hugo Awards). This isn't unheard of, but it is uncommon. Lois McMaster Bujold last pulled off the feat in 1991 / 1992 with The Vor Game and Barrayar. Before that it was Orson Scott Card for Ender's Game and Speaker for the Dead (1986 / 1987). Before that, well, there is no before that. Not in consecutive years. 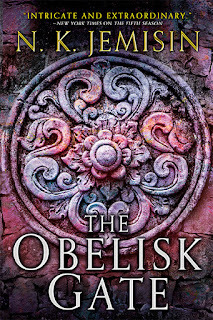 It is an amazing accomplishment and one that is so very deserved for the excellence that is The Fifth Season and The Obelisk Gate. Equally thrilling for me (and presumably for Seanan McGuire since she's the actual writer of the book) is the Best Novella win for Every Heart a Doorway (my review). It garnered an exceedingly rare 10/10 review here at Nerds of a Feather and it's one of the few books I wish I had the chance to read as a teenager. I think it would have been good for me twenty five years ago. 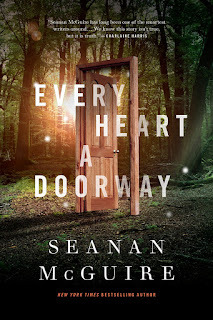 While I hope that next year there will be a greater variety of publishers represented on the ballot, Every Heart a Doorway was one of the true standout novellas from Tor.com Publishing's year of releasing top notch novellas. I could otherwise spend time on each category at far greater length, but I will leave that to simply say: congratulations to all of the winners. I'm perhaps not going to as deep into this as I have in previous years, but one of my favorite things about the Awards (besides being a finalist for one, obviously) is the wonkery of digging into the statistics released after the Hugo Ceremony. We can learn all sorts of interesting things from these reports. For example, The Obelisk Gate was in second place through the runoff tallying until the very last round when it finally gained enough votes to pull ahead of All the Birds in the Sky. Every Heart a Doorway had a definitive lead the entire time. Carrie Fisher almost received a posthumous Hugo for The Princess Diarist before eventually placing second behind Ursula Le Guin for Related Work. Looking at the vote tallies for Fanzine it was very clear the race was between Lady Business and Journey Planet. Nobody else was seriously in the running. Once you get past the fight for first place, you'll see a fascinating battle for third place between Nerds of a Feather and SF Bluestocking. We were so tight during the runoff for First Place, Second Place, and for all passes for Third Place until the final one. It looks like more of the voters who preferred Rocket Stack Rank had us more consistently higher than SF Bluestocking. The other thing I find fascinating about how runoff voting works is how Chuck Tingle had a very strong and dedicated voting base, but pretty much every other voter preferred other writers. This is how Tingle was in the lead for Fan Writer through the first four passes before Abigail Nussbaum overtook him for the win. But - despite how strong that voting base was, Tingle was not ranked high enough on other ballots to place higher than Fourth as the ranking continued. Some changes were made to the nomination process this year. First, while voters were still able to nominate up to five works, the final ballot would now include six finalists. Second, the rule requiring a finalist to be on at least 5% of all nominating ballots was eliminated. Though this was not an issue for most categories, prior to the nonsense of the last two years, there had been several years where Short Story only had 3 or 4 finalists. The number of venues publishing short fiction were increasing beyond the ability for most readers who are not our own Charles Payseur to keep up with everything (check out his Quick Sip Reviews) and that's a lot of short fiction to build enough of a consensus to hit that 5% mark over hundreds of nominators. The third major change is in how nominating ballots are tallied. The previous method was simple: the five or six works with the most nominations get on the final ballot, assuming eligibility. The newer method is a bit more complicated. It works on the same overall concept, but has a different mechanism for counting. It is called E Pluribus Hugo (out of many, a Hugo) and rather than my trying to come up with a better way to explain things, here is how EPH was described by the good people at Worldcon 75.
each nominee in that category. eliminated and removed from all subsequent calculations. Back to step 1 with the remaining nominees after the elimination. The above steps are repeated until there are only six nominees left. Those six become the finalists. This is how we see that The Obelisk Gate was on 480 nominating ballots, but only received 295.97 points. It means that The Obelisk Gate also shared ballots with some of the other finalists, thus diffusing the vote. Likewise, Nerds of a Feather was on 77 nominating ballots, but received 38.58 points in the end. It does raise a concern that individuals with a vested interest will start to nominate more strategically in order to boost the possibility their most preferred finalist makes the ballot. Will someone then only nominate two works they feel the strongest about if they think the other works they might have voted for would otherwise make the ballot? I wonder how much that could change the complexion of the ballot in the future, except there is no way to know how people would have behaved under different rules. It used to be easy to tell how close a particular work came to making the ballot. If sixth place received 87 nominations and the next work down had 85 nominations we know it missed the ballot by 2 votes. But, if you look at the stats for Fanzine you see that Galactic Journey appears to have more total points than SF Bluestocking, but SF Bluestocking was added to the ballot when File 770 declined. The report notes, though, that Galactic Journey needed 6 more votes to push SF Bluestocking off the ballot. The thing is that when a work is found to be ineligible after the notifications go out or when a finalist declines to accept a slot on the final ballot, the Hugo administrators do not rerun the calculations because that could actually remove one of the notified finalists and push a new one on and that would not be fair to the notified finalist. So, the last eliminated work is added to the ballot. I believe that’s the cause for the weirdness of how the tally for Fanzine looks. I do believe that the category is all the stronger because SF Bluestocking was on the ballot. I hope to see Bridget McKinney receive many more nominations both for Fanzine as well as for Fan Writer. But look at the notes for Fan Artist. The administrators note that if Galen Dara had .33 more points, eventual winner Elizabeth Leggett would have been eliminated in an earlier round of counting. Dara probably would have made the ballot at that point, but they would have had to continue to run the numbers to confirm that. They go on to note that Ariela Housman was 1 point away from knocking Leggett off the ballot and then run different scenarios that would have also changed the finalists. This goes to show that voting matters. Just a tiny change in voting patterns (or one more voter who preferred Galen Dara) and the winner of Fan Artist would not have made the ballot and 2013 winner Galen Dara may well be on it. Voting matters, and now how you vote makes can make a difference as well. 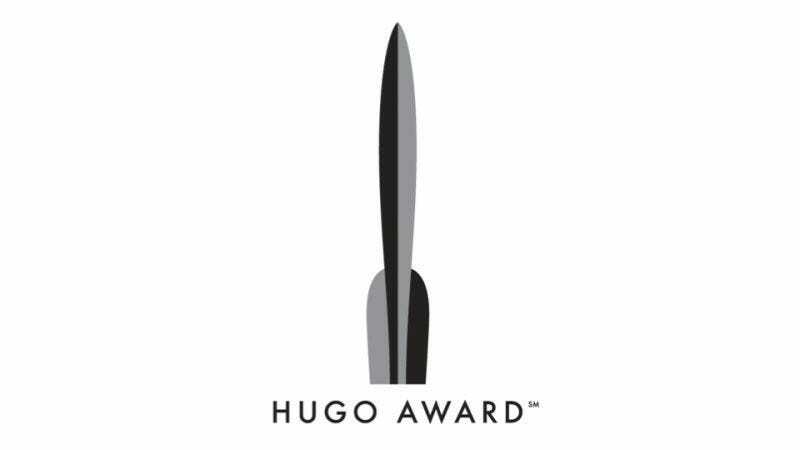 I'm not sure there is any specific takeaway this year, except that some really awesome stories and novels and artists and writers won Hugo Awards. Because of E Pluribus Hugo, the ballot was shenanigans-light and that is a vast improvement over the past two years. 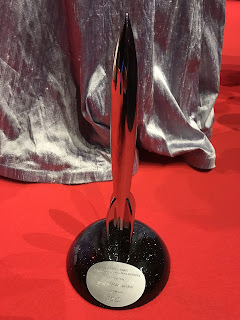 Though I am naturally disappointed that Nerds of a Feather did not win (I really, really wanted a Hugo), I am so very happy for the editors of Lady Business. I've been reading them for years and they do excellent work. Finally, thank you again to the 77 people who thought well enough of us to nominate Nerds of a Feather to place us on the ballot and thank you for everyone who ranked us on their final ballots - especially the 148 people who ranked us first. It means more to us than we can express. It truly has been an honor to be nominated. These last four months have been surreal and weirdly stressful and hopefully we get to do it all again next year. We'd love to all go to San Jose and meet as many of you as possible.